Sometimes you just need a snack. A canape. A tapa. A morsel. And sometimes the husband makes a request that said snack include blood sausage. He's like that. And when someone makes a special request that I make a blood sausage tapa, I pretend that I selflessly do this for said someone. But we all know, I have just been waiting for an excuse. You see, blood sausage is not something frequently in our dinner rotation, and for good reason. While protein and iron are high, so is fat; thus, blood sausage appears only on special occasions. 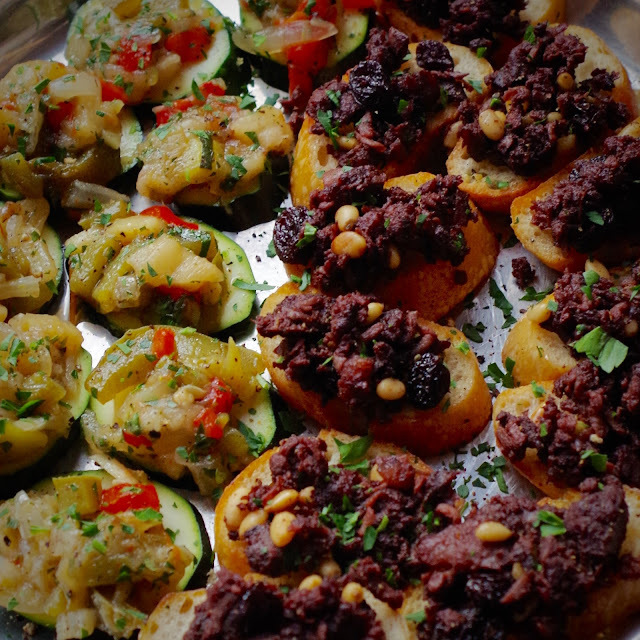 We were invited to an Oscars Night dinner at the in-laws and instructed to bring appetizers. Enter blood sausage request. 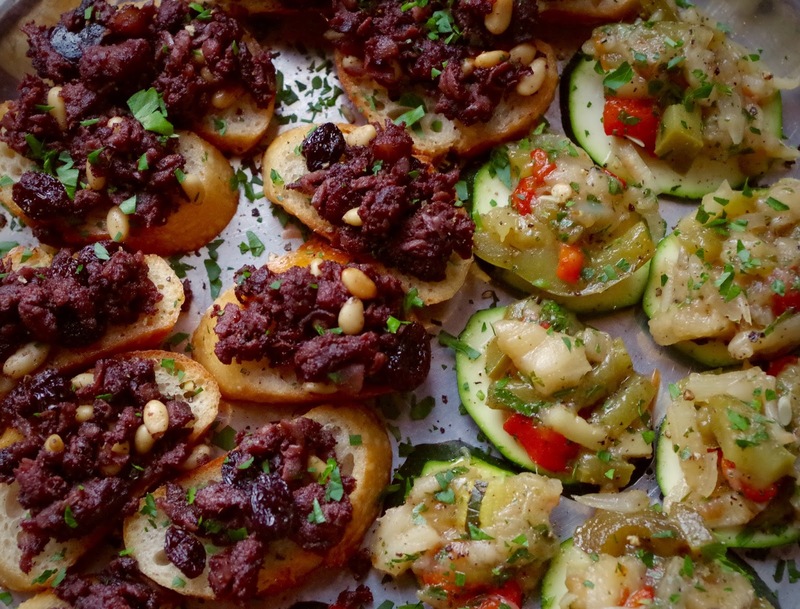 I couldn't, however, serve only the blood sausage canapes, as they are not to everyone's liking--plus I have an ill-placed anxiety about showing up without enough food. So in a gesture of good will, I coupled this hearty bread-forward tapa with a lighter, solely vegetable one. 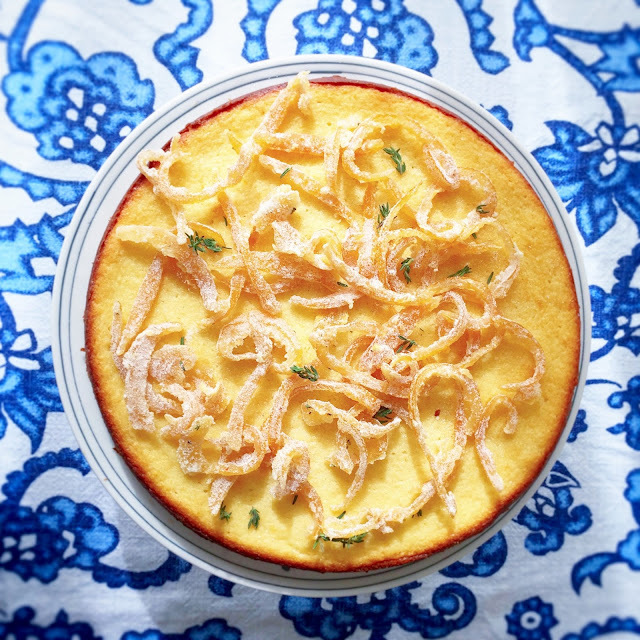 I have waxed on about my love of Penelope Casas's Spanish cooking (see here, here, and here), and this entry is no different. The Black Sausage with Raisins and Pine Nuts tapa is a simple, salty, sturdy appetizer that holds hunger at bay easily. 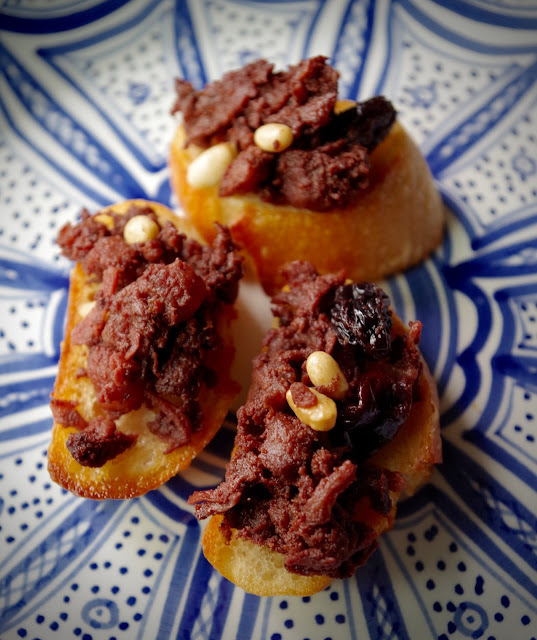 Spaniards take their blood sausage seriously, and Casas lets the paprika, onions, and fat coupled with blood shine. 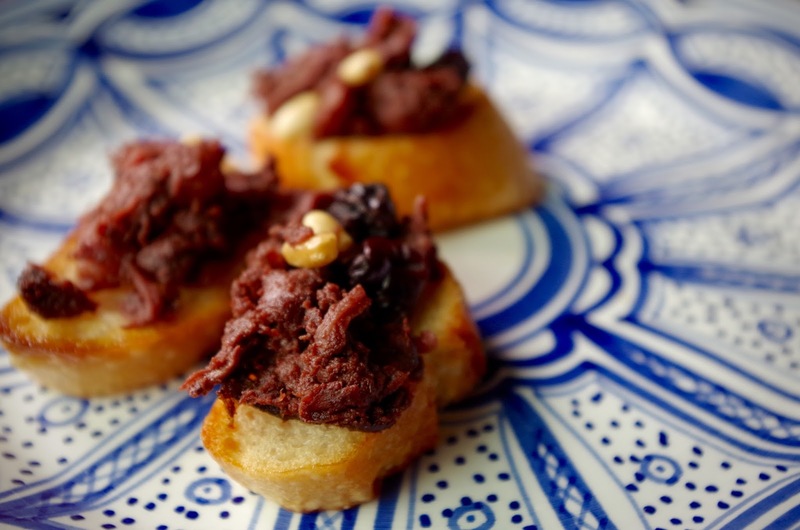 I know it sounds a little off putting, but trust me, it really is worth getting over any queasiness and trying this appetizer at least once. The recipe calls for only 8-10 toast rounds. Believe it. You will have an abundance of topping left over: but save that crumbly mixture with sweet raisins and crunchy pine nuts for a piece of crusty bread for lunch tomorrow with a drizzle of olive oil. 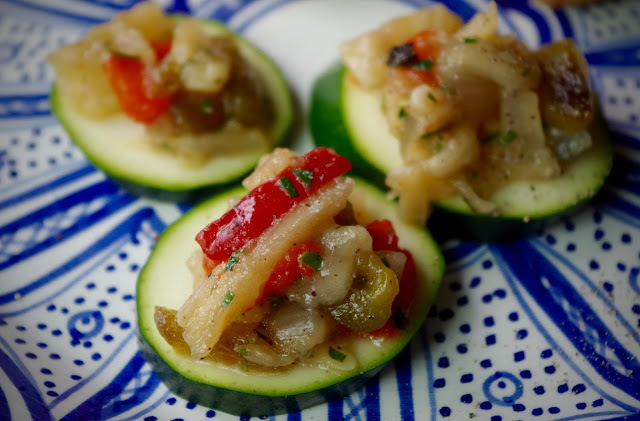 Tonight, don't fill up on these little appetizers... because the zucchini rounds are equally worth saving some room for. 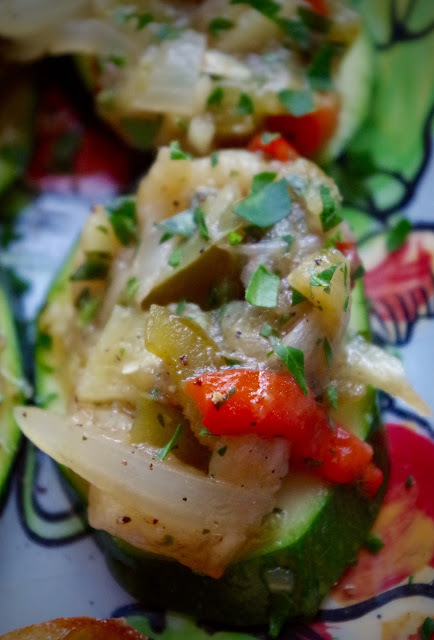 The Roasted Vegetable Canape is a mash of roasted and chopped vegetables piled high on a raw zucchini round (toast rounds will do, too, but Casas recommends the lighter zucchini slices). With a generous pinch of salt atop, low-calorie and high-virtuosity counter the heaviness of the blood sausage. And, yes, you'll make too much topping again, but it's divine mixed the next day with some orzo and goat cheese. We snacked on both of these appetizers before a delicious meal from the in-laws and plenty of reactions to the Oscar debacle of 2016 (I have a multitude of thoughts, not all of them pleasant, about how the Oscars went this year). We left, waddling to the car, stuffed full from the first bite of tapas to the final bite of a banana cake. Delightfully, we had plenty of toppings left for lunch the next day. And the next after that. I just hope the husband makes another blood sausage request for next year's Oscars, which will hopefully be a little more aware of its audience. 1. Soak the raisins in warm water to cover for about 20 minutes, until they plump up. Drain. 2. Heat the oil in a skillet until the morcilla begins to brown and gives off its fat. Drain the morcilla on paer towels and pour off the fat from the skillet. 3. Skin the morcilla, mash with a fork, and return to the skillet. Cook for 1 minute, then stir in the raisins and pine nuts, and cook for another minute. Serve on bread rounds. 2. Pierce the eggplant with a fork to allow steam to escape. Arrange the eggplant, red bell pepper, green bell pepper, 1 medium zucchini, and onion in a roasting pan and roast for about 30 minutes, turning the eggplant and peppers once. Cool. Skin, core, and seed the peppers. Cut the eggplant, peppers, zucchini, and onions roughly into julienned strips about 1 inch long. Place in a bowl, and gently mix in the olive oil, a few squeezes of lemon juice, the parsley, thyme, salt and pepper. 3. Lightly sprinkle the zucchini rounds and let sit for a few minutes. Top the zucchini rounds, or bread rounds if you're using those instead, with the vegetable mixture. Serve at room temperature.